Did you know there are over 7,000 studies researching the efficacy of turmeric and it’s active component curcumin? 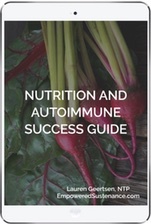 You’ve certainly heard the anti-inflammatory benefits of turmeric touted by practitioners, blogs, and wellness publications. I believe this highly-pigmented herb belongs in everyone’s wellness arsenal, both as long-term maintenance and acute inflammation relief. 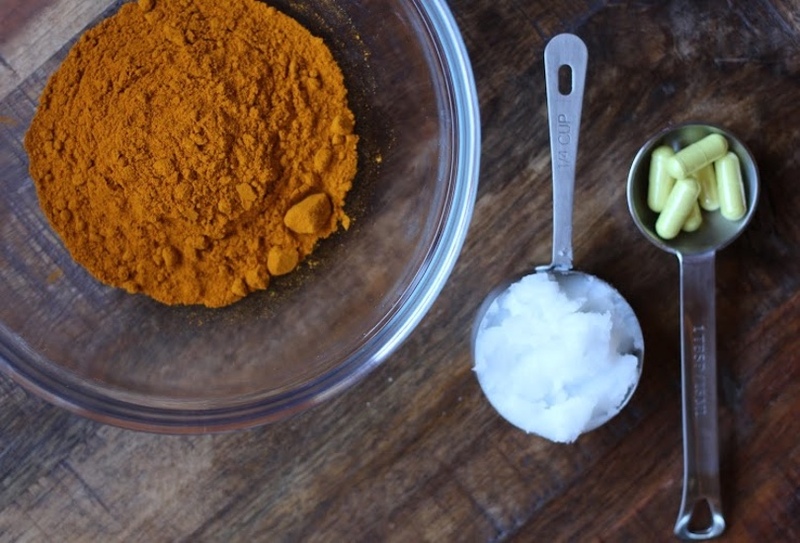 Here’s a simple way to get turmeric into your day! I add turmeric to curries and vegetable soups on a regular basis, but, while this is certainly providing some benefit, it is not a highly concentrated dose of the herb. 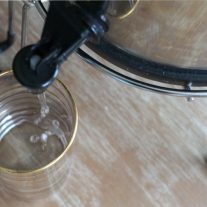 When I was in need of acute inflammation help, I added a couple tablespoons of turmeric in half a cup of water and gulped (or rather gagged) it down. If you’ve ever eaten straight turmeric, you know how bitter it can taste. 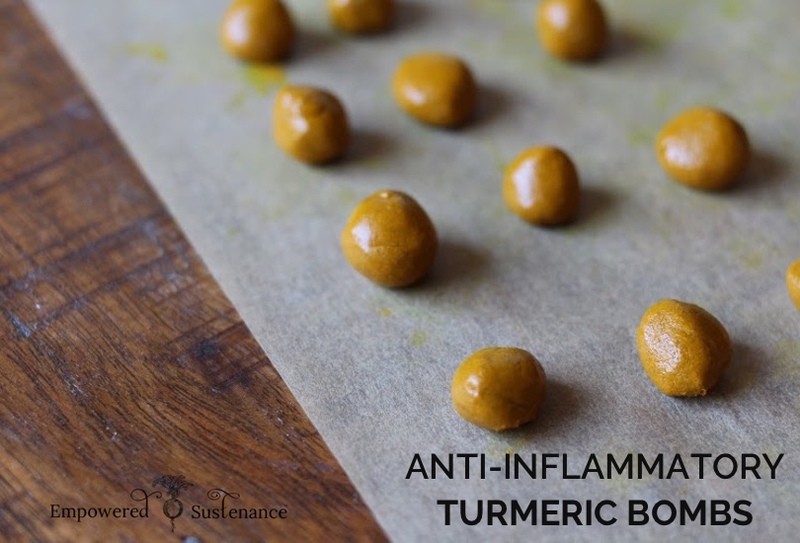 Now, when I feel the need for a turmeric hit, I’ll reach for these turmeric bombs. They are an easy way to get the benefits of turmeric without the bitter flavor. 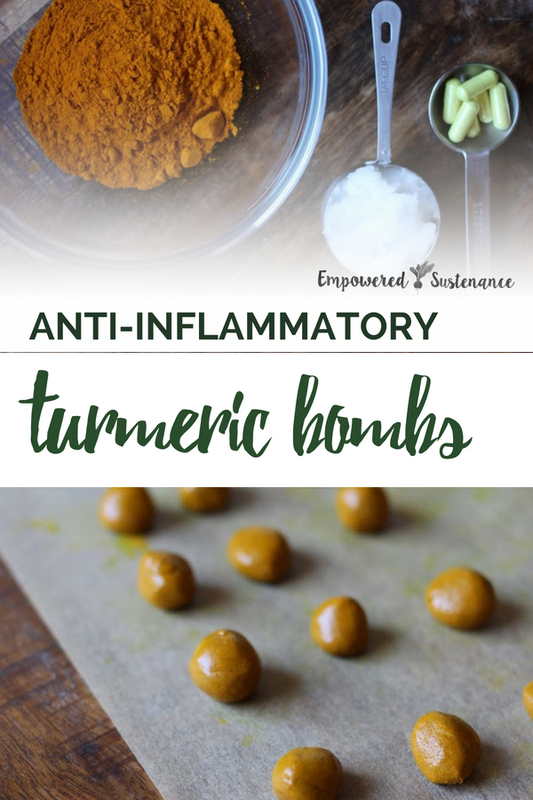 Even better, they contain a couple special ingredients to work synergistically with the anti-inflammatory properties of turmeric. 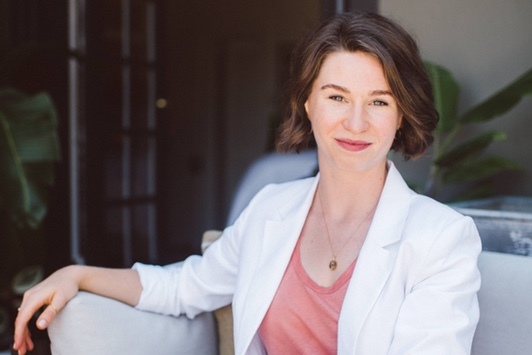 This concept of turmeric-honey pills was recently told to me by my friend Anna Matriotti, an experienced herbalist, nutritional therapist and president of the Washington chapter of the American Herbalist Guild. She shared this tip in her presentation at the 2015 Green Gathering, an herb/wildcrafting workshop. Quercetin, a bioflavenoid, inhibits an enzyme that decreases the activity of curcumin. 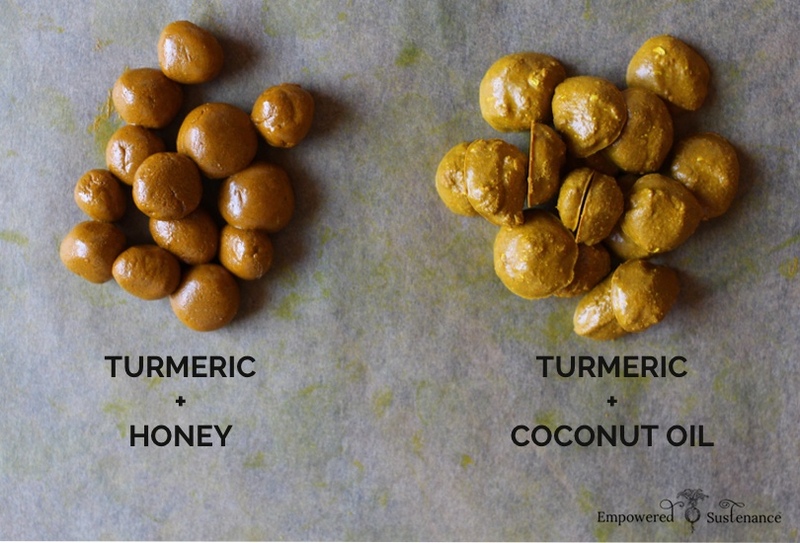 I’ve included two variations for turmeric bombs: one made with honey and one made with coconut oil or ghee. The honey variation is easier to swallow, so it is better suited to children. The honey also masks the bitter taste of the turmeric when the pill is swallowed. 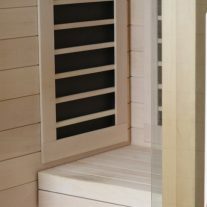 I would recommend starting with this option. The coconut oil/ghee option has the benefit of being sugar free and also includes the fatty acids that improve the absorption of curcumin. However, the pills flatten slightly on the baking sheet into rougher shapes, which may be more difficult to swallow. They also have a slight flavor when swallowed. Serves: A lot... I think it made around 50, but I didn't count each one. The active compound curcumin, found in turmeric, has been widely studied for its potent anti-inflammatory effects. These DIY Turmeric supplements contain quercetin and black pepper, two ingredients shown to improve the bioavailability of curcumin. Line a baking sheet with the unbleached parchment paper. Make room in your freezer to put the cookie sheet for a few hours when the Turmeric Bombs need to set. If you are like me and have a tendency to spill things, wear an apron! Turmeric powder stains clothing, and the powder can get on your clothes if you stir the mixture too vigorously. Select one of the binding agents. You will need approximately 3 tablespoons. If you choose raw honey and it is thick, melt it in a saucepan over very low heat until it is pourable. Do the same with the coconut oil or ghee so it is liquid, but not hot. In a bowl, stir together the turmeric, quercetin, pepper, and binding agent. If using honey, you should have a thick and pliable mixture. If using oil, you should have a thick mixture with which you can form pills. For the honey variation, pinch of small amounts of the "dough," roll between your palms, and place on the baking sheet. For the oil variation, use a spoon to scoop small pill shapes onto the baking sheet. Freeze until firm, then transfer to a storage container and keep in the freezer. Take the turmeric bombs as needed. You can't overdose on them. However, if you take a lot of the oil-based ones, the fat content may upset your stomach. It using the honey version, keep in mind that it does contain sugar (albeit unrefined and enzyme-rich sugar). How much curcumin will these contain in milligrams? I made these & they were very bitter – taste terrible. What could I have done wrong? Depends on the quality of the turmeric, I find the yellow (chinese) supermarket shelf varieties > horrible smell and very bitter taste. I’m lucky I make my own from sweet earthy smelling orange/red curcuma longa (indian). Buy organic or direct from farmers market. 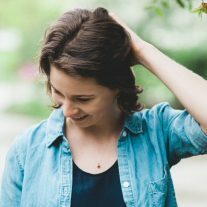 Hi, Lauren, I just discovered your site, thanks to a friend’s sharing. So many great insight, tips, and tricks here! And there is one thought I hope you’ll consider. We live in a world where there is far more war and weaponry than we could ever need. Please think about your word choice. Why the word bomb? It’s everywhere. If we don’t stop bombing in our words, how are we going to stop bombing with weapons. As clever and wise as you are, I know we’ll love whatever alternate word choice you come up with. I hope you will. I hear you, that word does carry some heavy connotations. 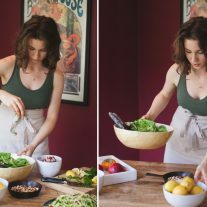 If I made a similar recipe like this in the future, I’ll consider a different term! Lauren IMHO, I believe its appropriate ‘bomb’ Turmeric is like dynamite to diseased/cancerous cells, literally blasts them to oblivion. I suppose you could use Tumeric Blasts. That’s a clever name idea! When I made my mixture of turmeric/coconut oil/pepper, I realized there was way too much for me, as an individual, to consume on a regular basis before it reportedly went bad. When one only needs to take about a teaspoon a day, I didn’t want any of it to go to waste. So when searching the internet further, I was inadvertently forwarded to your website. I felt your recipes and recommendation to make any overage into little “bombs” was fabulous by freezing them for daily use. I did freeze them and put them in a mason jar, however, these little guys stuck together and became difficult to separate within the jar. I am thinking that coating the frozen “bombs” with oil before freezing may help keep them separated? Do you have any ideas? As far as one of your comments from a person who refers to themselves as “Jeanine, Compassion’s Doorway”, I have to say this… It’s so unfortunate that, in our society, there are so many people, who obviously needs force their opinion on everyone to be so “pc correct” and felt the compulsion to offer you constructive criticism. Your word “bomb” is just fine. I put my new frozen little “bomb” in my heated coconut milk and it exploded with flavor and color. So what? I loved it! Bombs have different definitions, not just her negativity. Also her tag of “Compassion’s Doorway” looks as if it is just a plug for her failing business. She obviously has no “compassion” for what your website offered. To quote her manipulative and condescending statement to you, “As clever and wise as you are, I know we’ll love whatever alternate word choice you come up with. I hope you will.” My comment to that is… “Maybe Jeanine, as clever and wise as you “think you are”, I know I’ll love whatever alternate word choice you can come up with for your business. I hope you will”. Hi I put the paste into small plastic ice cube tray and froze it. I put the ice cube tray in a plastic bag to keep in freezer. I found silicone mini ice cube trays on Ebay. I make them and keep them in the tray, in the freezer in a zippy bag. Just pop them out as needed. Ouch. Jeanine was so respectful. This comment, not so much. Wonder why such a simple suggestion engendered such hostility? I submitted my comment two days ago. What happened to it? Why wasn’t it displayed? I see it was just now displayed. I suppose it takes a couple of days. Thank you. You must be do far to the left that even the liberals won’t claim you. Look at the context…in which the word was used. Powerful Antioxidant is what I get out of it…nothing else. Please leave politics out of this. Her choice of words is spot on. Love your blog. Do you have a discount code for organic Gemini??!! I can’t wait to try their products!! No, I don’t have a coupon for them and I get their products on Amazon for the best price. Once you make the balls, how many do you eat per day? What form of quercetin should be used? Powdered quercetin which you can find in capsules at health food stores. My husbands doctor recommended this recipe for his inflammation. I made the mixture but it will not form. Even after freezing as a big puddle, it still won’t harden enough to even break. I can bend the whole blob. The only thing I can think of is that the health store employee talked me into quercetin +C because it had a higher does of quercetin. Could the C be messing with the mixture? Because these ingredients are so expensive, I don’t want to throw it away. Any suggestions? Can I substitute the quercetin with ginger? I’m interested in trying this because it sounds like a much quicker and easier way to take my daily turmeric than making tea every day. Ginger has different properties than quercetin and is not interchangeable here. You can omit it if you cannot access it. Thanks for sharing. I have arthritis, and have been wanting to try the tumeric for inflamation. To just drink it in water is aweful. Im going to try this. Thanks again.